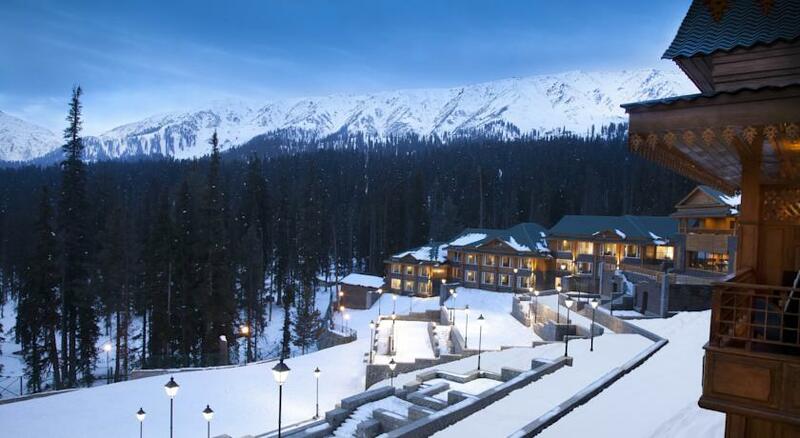 Located close to the Gulmarg Gandola Ski Lift facility, The Khyber Himalayan Resort and Spa is a well reputed star property that is popular among VIP guests and high profile travelers visiting Kashmir. The hotel is located in scenic surroundings and therefore is an ideal place for patrons visiting Kashmir to enjoy the paradisiacal beauty of this place. Khyber Himalayan Resort has earned praise and respect from guests as a luxury retreat center that caters to both nature lovers and adventure seeking guests. Over the year, the hotel has earned respected in hospitality sector and is now considered a benchmark for competitors to match upto. 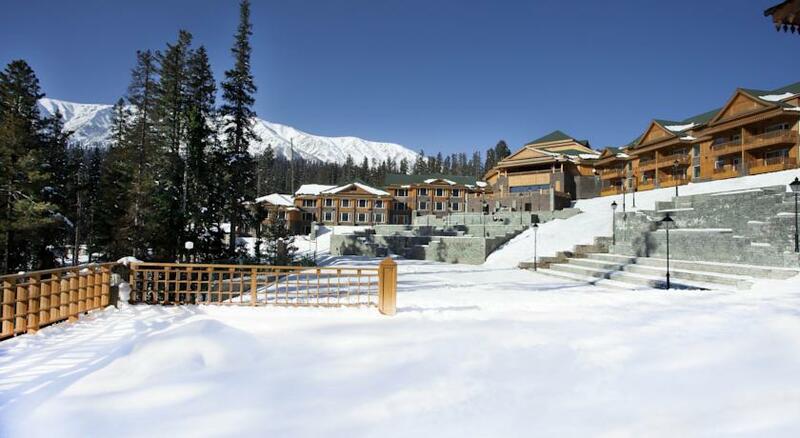 Khyber Himalayan Resort is a unique property that offers just the right things that guests need. Keeping this in mind, the resort has developed five types of accommodation choices to cater to different needs of guests. These include Premium Rooms, Luxury Balcony Rooms, One Room Luxury Cottages, Two Room Luxury Cottages and Presidential Suites. 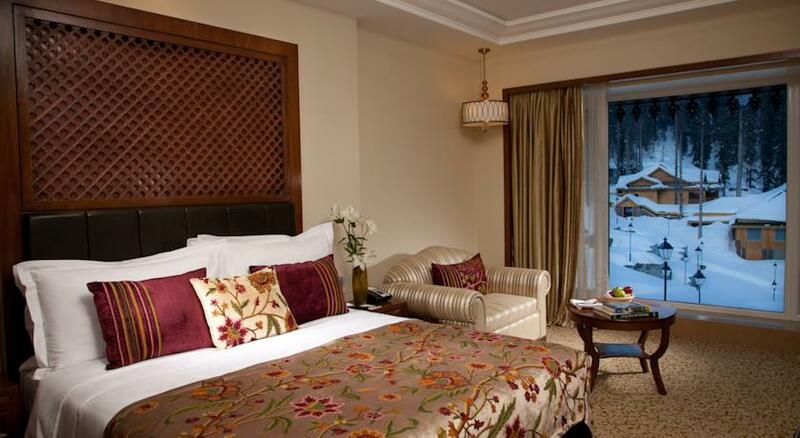 All these accommodation options are designed by expert decorators to meet taste preferences of guests. They are also equipped with all modern comfort creatures to ensure complete comfort and lavish pampering for guests during their stay here. Apart from rooms, the hotel also offers several other facilities to make stay of patrons more memorable at Khyber Himalayan Resort. The hotel has three culinary delights in the form of Cloves – the multi cuisine restaurant, Nouf – the barbeque bistro and Chaikash – the Tea and Coffee Lounge. 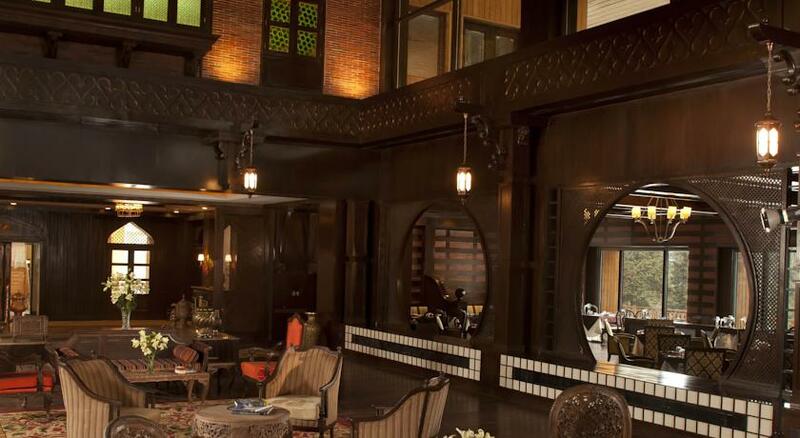 There also is a Cigar and Sheesha lounge called Calabash, where guests can choose to relax and unwind. Other facilities offered here are an in house Spa, conference rooms, meeting rooms, banquet facilities, gymnasium and health center and many more. To cater to adventurous folks among guests, the resort also offers activities such as skiing, trekking, horse-riding and carting. 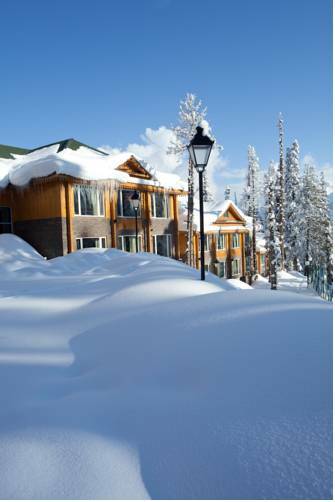 Premier Rooms are the simplest and most affordable accommodation choice available at Hotel Khyber Himalayan Resort and Spa in Gulmarg. 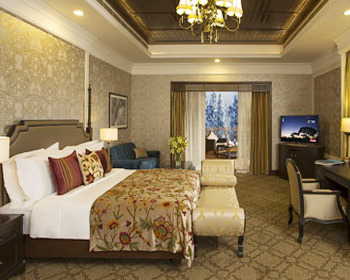 Although simple by hotel standards, the Premier rooms are nothing less than lavish exotic option to spend your vacation in Gulmarg. The rooms are designed to cater to solo travelers and couples who need all basic amenities to ensure comfortable stay. 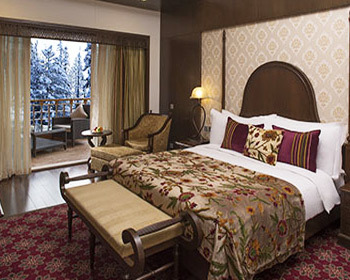 Spread across an expanse of 386 square feet, the rooms are decorated with indigenous crafts and artifacts that reflect the rich cultural heritage of Kashmir in general and Gulmarg area in particular. The rooms are also Luxuriously furnished and special care is taken to design it in such a way that it opens of ample room on the inside to help patrons carry on their daily activities with ease. As far as amenities are concerned, the Premier Rooms are provided with high speed internet access through Wi-Fi, 44 inch LED television with satellite connectivity and subscription to premium channels, DVD player (available on demand), Telephone with direct dial facility and voice mail, round the clock room service and in room dining facility, central heating with thermostat, hair dryer, mini bar or refrigerator, tea and coffee maker, wardrobes and closets, electronic safety deposit locker, plush bed, luxury duvets, pillow menu and seating sofa unit, daily housekeeping facility and turndown service, lavish bathroom with Ayurvedic bath essentials, bathrobes and many more. Unmatched facilities at an unbeatable price are the two factors which make Premium Room a hot favorite among guests staying at Khyber Himalayan Resort and Spa. If enjoying scenic natural beauty right from your balcony is your idea of a perfect vacation, then the Luxury Balcony Rooms will surely capture your imagination. 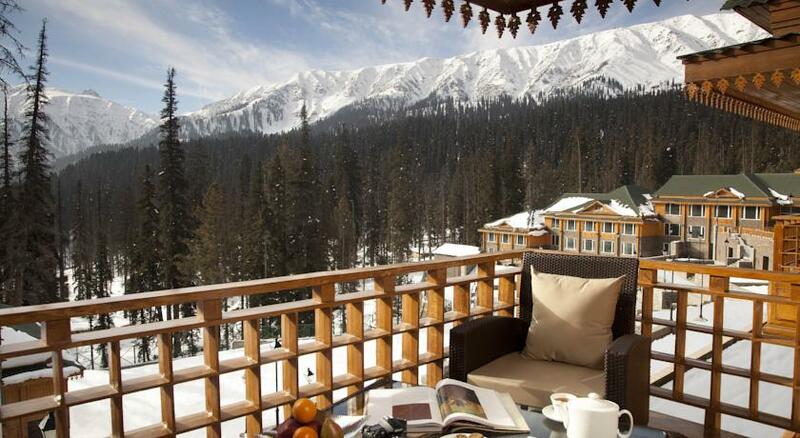 Designed for guests who like to be close to nature, the Luxury Balcony Rooms offers guests a perfect avenue to enjoy the beauty of Kashmir right from their Balcony. Apart from this, the room is designed by fusing contemporary design theme with traditional elements of Kashmiri décor style, which gives the room very regal and plush look and feel. 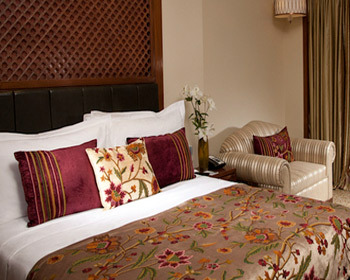 Spread across 568 square feet of area, the Luxury Balcony rooms sport charming décor that is inspired by Kashmiri crafts, it be carved walnut panelling, teakwood floors and papier mache accents or silk carpets from local looms. The lavish furnishing and perfect fit and finish gives the room delight aura and appeal. Luxury Balcony Rooms also are provided with a separate dressing area and a lavish bathroom that is equipped with a sunken tub where large picture windows offer brilliant views. Other amenities provided as part of Balcony Rooms include high speed internet access through Wi-Fi, 44 inch LED television with satellite connectivity and subscription to premium channels, DVD player (available on demand), Telephone with direct dial facility and voice mail, round the clock room service and in room dining facility, central heating with thermostat, hair dryer, mini bar or refrigerator, tea and coffee maker, wardrobes and closets, electronic safety deposit locker, plush bed, luxury duvets, pillow menu and seating sofa unit, daily housekeeping facility and turndown service, lavish bathroom with Ayurvedic bath essentials, bathrobes and many more. 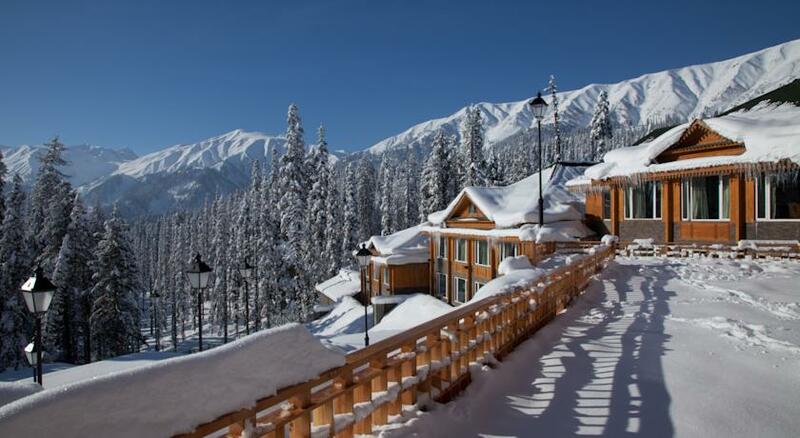 Traveling with your family to Gulmarg or you are a couple who needs more space to enjoy your vacation - whatever be the need, Luxury One Bedroom Cottage will serve your purpose. These are special cottages that are designed with aim of offering extra space to guests. The cottages are laid out on an expanse of 648 square feet and offer a lavish and private cottage setup, in which you can spend your vacation in the midst of scenic natural beauty. The One Bedroom Luxury Cottage consists of a bedroom, a spacious bathroom with a separate dressing room, sunken bathtub and wall-length picture window, a living room and a balcony. 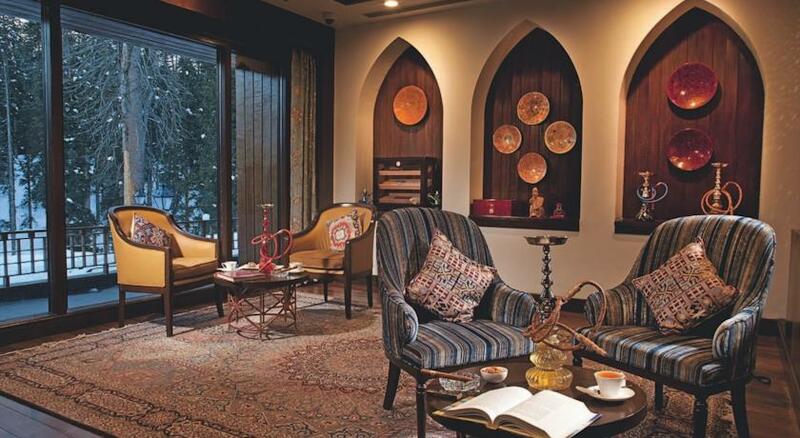 This unique setting is complemented by classy décor style that reflects the rich heritage of Kashmiri arts and craft. Patrons have been very appreciative of the carved walnut panelling, teakwood floors, paper mache accents and silk carpets from local looms as furnishing options used in the Cottage. Talking about amenities, the Luxury cottage has been provided with all modern comfort creatures to ensure pleasurable stay for guests. The notable among them include high speed internet access through Wi-Fi, 44 inch LED television with satellite connectivity and subscription to premium channels, DVD player (available on demand), Telephone with direct dial facility and voice mail, round the clock room service and in room dining facility, central heating with thermostat, hair dryer, mini bar or refrigerator, tea and coffee maker, wardrobes and closets, electronic safety deposit locker, plush bed, luxury duvets, pillow menu and seating sofa unit, daily housekeeping facility and turndown service, lavish bathroom with Ayurvedic bath essentials, bathrobes and many more. 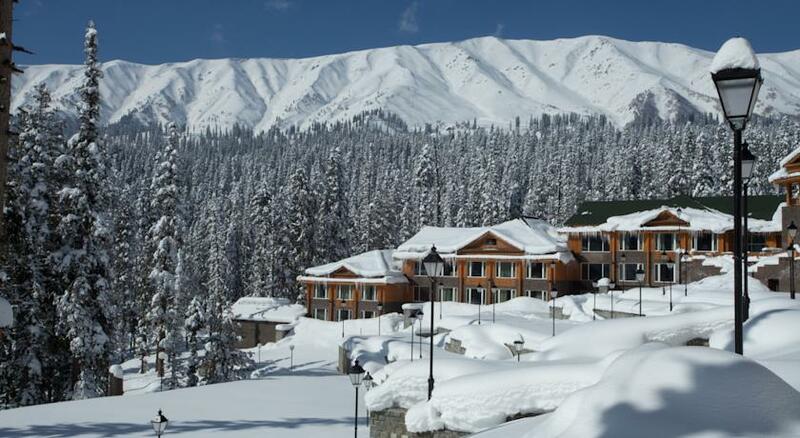 If you are visiting Gulmarg for a vacation with a large family or with group of friends, then you will need an accommodation option that offers ample space and caters to diverse requirements of different members of the group. 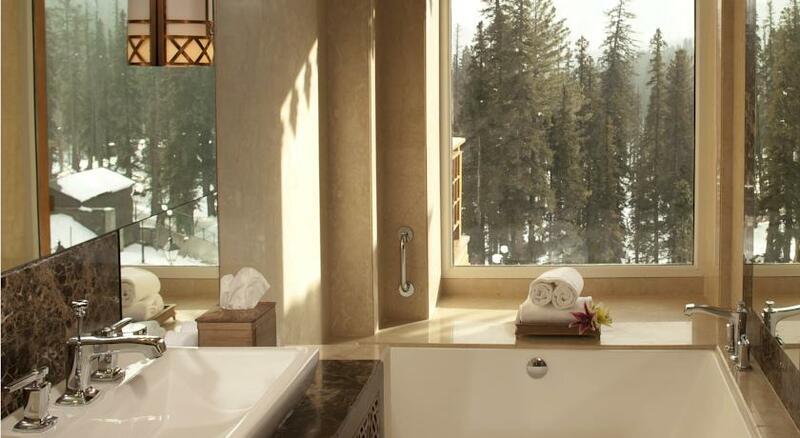 Worry not, because Khyber Himalayan Resort and Spa has just what you need in the form of Luxury Two Bedroom Cottages. These Cottages are aimed at group travelers and help guests to stay with their loved ones and spend their vacation together. The Two Bedroom Cottages are designed by expert designers keeping in mind various requirements and tastes of patrons. The décor has been developed by fusing contemporary design style with local Kashmiri décor theme and use of furnishing options such as carved walnut panelling, teakwood floors, paper mache accents and silk carpets from local looms gives the cottage very charming aura and feel. Spread across an area of 1296 square feet, the Luxury Bedroom Cottage consists of two bedroom, en suite bathrooms with sunken bathtubs and picture windows, a full-service kitchen, a living room and a large balcony that is deal to adore the scenic beauty that surrounds the Cottage. To ensure that guests have a memorable stay experience at Luxury Two Bedroom Cottages, they have been equipped with best of amenities and facilities such as high speed internet access through Wi-Fi, 44 inch LED television with satellite connectivity and subscription to premium channels, DVD player (available on demand), Telephone with direct dial facility and voice mail, round the clock room service and in room dining facility, central heating with thermostat, hair dryer, mini bar or refrigerator, tea and coffee maker, wardrobes and closets, electronic safety deposit locker, plush bed, luxury duvets, pillow menu and seating sofa unit, daily housekeeping facility and turndown service, lavish bathroom with Ayurvedic bath essentials, bathrobes and many more. 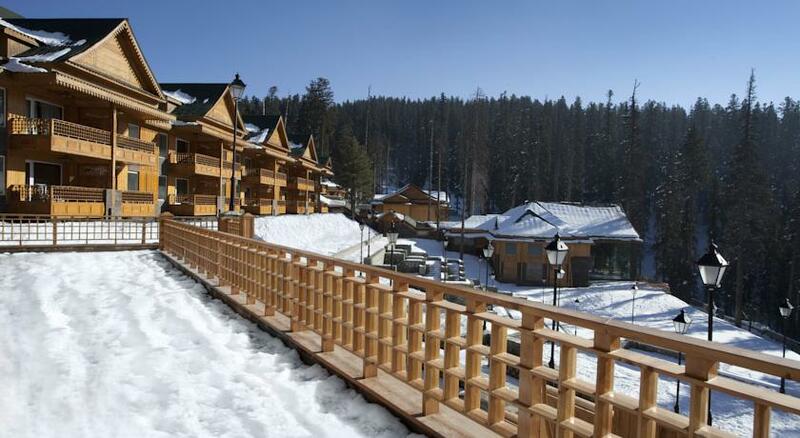 If you prefer Kingly comforts and lavish indulgences to make you vacations memorable, then go ahead and book a Presidential Cottage offered by Hotel Khyber Himalayan Resort and Spa in Gulmarg. As the name suggests, Presidential Suites are the best accommodation offering available at the hotel and they justify this tag by offering an exceptional stay experience for guests. The Presidential cottages are aimed at pleasing high profile guests and VIP patrons, who stay at Khyber Himalayan Spa and Resort hotel and therefore are tailored to meet specific demands and tastes of such guests. 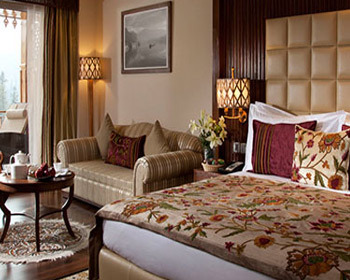 The décor of the Suite is designed by combining best of Kashmiri décor style and contemporary design themes, which brings out best of both the world and is sure to appeal to any kind of person. 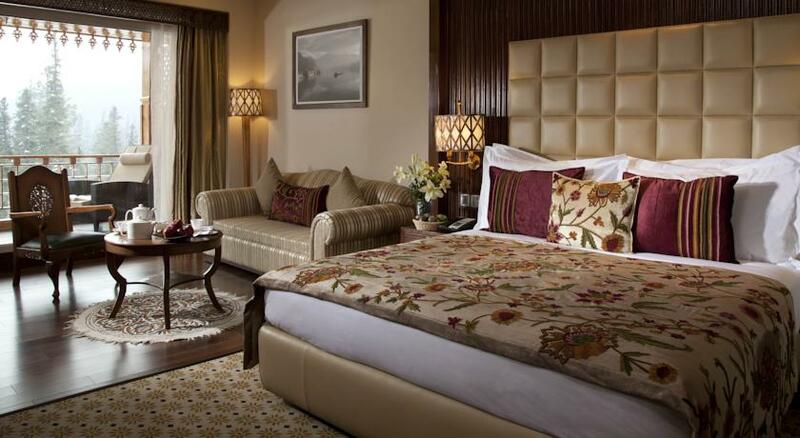 The interiors also reflect the rich cultural heritage and opulent crafts of Kashmir with help of carved walnut panelling, teakwood floors, paper mache accents and silk carpets from local looms. The Presidential suites are spread across an area of 4227 square feet and comprises of a large master bedroom, two additional bedrooms each with a luxurious bathroom, a private heated plunge pool with a jacuzzi, a living room, dining room, a full kitchen and a spacious private garden. The Suite directly over looks Affarwat range and the verdant valley and fills all the rooms of the suite with scenic charm and delightful aura. To ensure that guest stay pampered during their stay in Presidential Suite, it has been equipped with best of comfort creatures and lavish pleasures such as high speed internet access through Wi-Fi, 44 inch LED television with satellite connectivity and subscription to premium channels, DVD player (available on demand), Telephone with direct dial facility and voice mail, round the clock room service and in room dining facility, central heating with thermostat, hair dryer, mini bar or refrigerator, tea and coffee maker, wardrobes and closets, electronic safety deposit locker, plush bed, luxury duvets, pillow menu and seating sofa unit, daily housekeeping facility and turndown service, lavish bathroom with Ayurvedic bath essentials, bathrobes and many more. If you are a foodie who enjoys great food from across the globe and savors exotic flavors, then the Cloves Multi Cuisine Restaurant will surely serve you well. 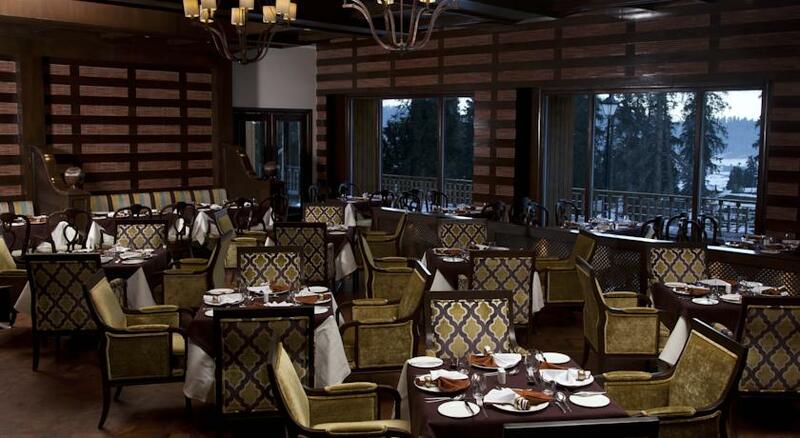 The Cloves restaurant is developed as part of the Khyber Himalayan Resort and Spa Hotel in Gulmarg and serves as primary diner at the hotel. Being located on the premises of the resort, Cloves allows patrons easy access to world of culinary delights that are not only scrumptious but also healthy in nature. The Cloves restaurant serves an array of dishes from cuisines across the world, be it oriental, Indian, continental or any other. Patrons are advised to try Wazwan specialties served at Cloves – they are prepared as per traditional Kashmiri recipes which bring out their unique flavor and aroma. 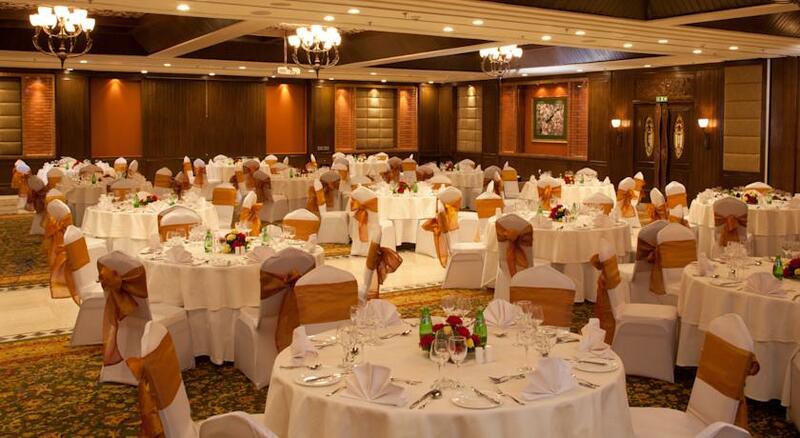 Apart from the food, patrons have been highly appreciative of the setup and décor style of the restaurant. The Cloves diner directly overlooks the majestic scenery and natural beauty that surrounds the resort and the interior décor of the restaurant is designed in a way that it complements this view. Comfortable seating arrangement along with warm hospitality and unmatched view make Cloves – a culinary delight that every guest visiting Gulmarg must try. Looking for a scenic and calm spot to enjoy a lovely dinner with your loved ones? Then NOUF Restaurant will surely please your imagination. 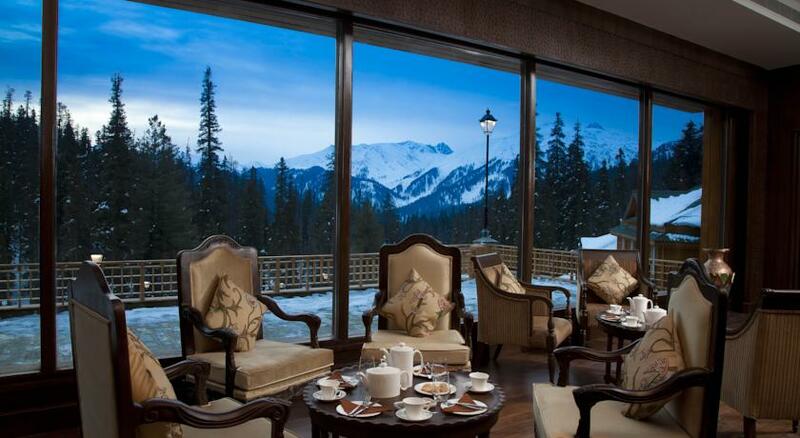 Located on premises of luxury hotel – The Khyber Himalayan Resort and Spa, NOUF offers unique setting that is complemented by magical view of unparallel scenic beauty, which enriches the dining experience of the guests. As far as cuisine is concerned, NOUF primarily serves barbeque delicacies in both vegetarian and non-vegetarian platters. The delicacies are prepared as per traditional cooking methods with use of rare and exotic spices, which brings out unique flavors. The casual setup of NOUF restaurant is ideal to laze around and catch sun rays during day time or enjoy dinner while star gazing at night. The comfortable seating arrangement and attentive staff make NOUF a perfect place for family dinner or a romantic date with your loved ones. If you are a Chai love or a need a regular dose of refreshment to keep you going through the day, then Chaikash is the place for you. Rightfully after the Kashmiri word for soaked tea leaves, Chaikash serves an array of teas, coffees and other beverages to keep patrons refreshed. Guests can choose to complement their beverages with snacks and mini meals that help patrons stay full and satisfied during the day. Business guests have showered their praises for Chaikash, as it helps them keep up with their cruel schedule by offering take away meals and short bites. The casual décor of Chaikash also earns it the title of being the official hangout place of the hotel, where people can meet and catch up with their families and friends over snacks. 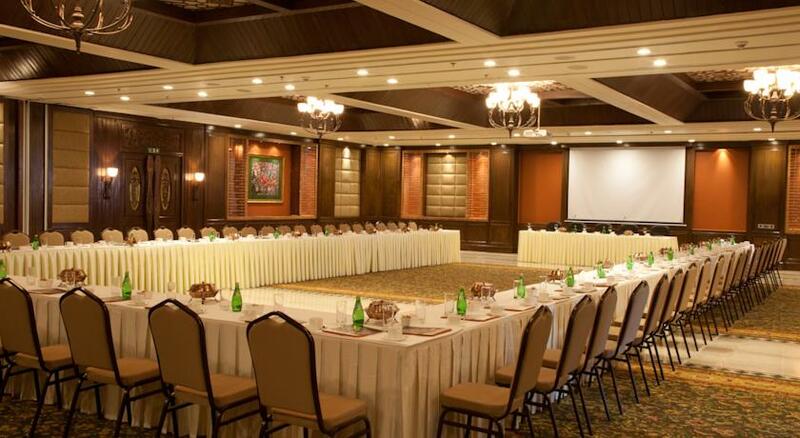 Comfortable seating arrangement and stylish décor also makes it a great place for business meetings or catching up with colleagues for work related matters. Chaikash over the years has earned its place in heart of guests staying at the Khyber Himalayan Resort and Spa and is sure to cater to all their needs with ease. If you like to chill out in style while enjoying scenic locations and natural beauty, then Calabash is the place you should head. Calabash is a unique offering by the Khyber Himalayan Resort & Spa in Gulmarg, which specializes as a cigar and sheesha lounge. The lounge offers an array of internationally popular cigars such as Partagas®, Monte Cristos ® and other coveted names, carefully selected for humidor. Guests can also enjoy an assortment of flavoured tobaccos in sheesha at Calabash. 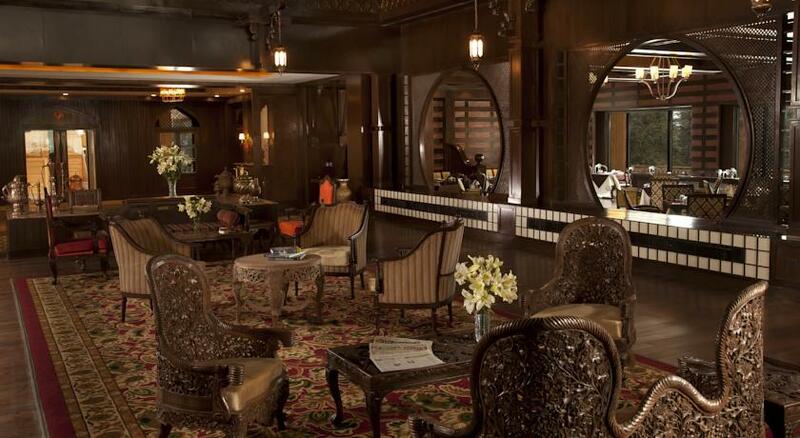 The regal décor and lavish setting of Calabash makes it a great place to hangout with friends and catch up while enjoying the scenic view and chosen Cigars and Sheesha. 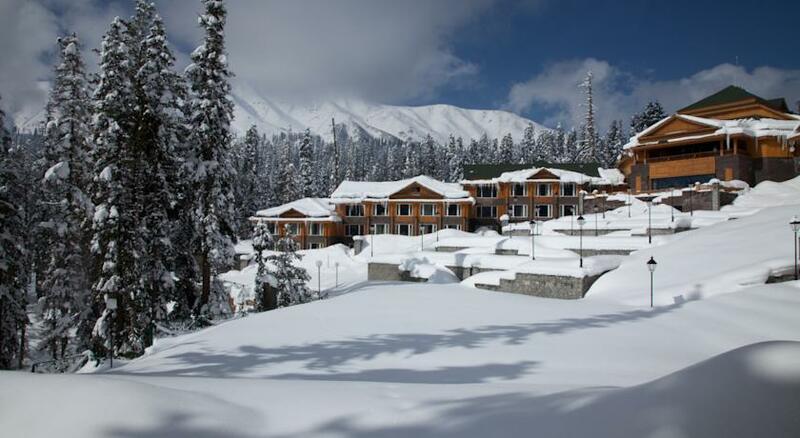 Do not miss out on visiting this during your visit to Gulmarg.